Aggregate Tracker Redress & Compensation is hurtling towards 1 billion Euro. 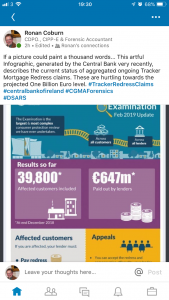 The Central Bank of Ireland generated this artful Infographic Central Bank Tracker Redress Feb 2019 update . 39,800 borrowers have been impacted under Tracker Redress since 2015. Tracker Redress to Dec 2018 is Euro649 million. 15 Irish Banks or banking groups implicated culminating in setting in place of a formal scheme for Tracker Redress. There is a Regulatory scheme in place whereby the culpable banks must pay, inter alia (a) Compensation, (b) redress, and (c) recognition of the Time Value of Money, (d) demonstrable consequential losses, (e) medical costs with respect to distress . Sums offered by way of redress to date can be accepted without compromising future pursuit options. Therefore affected Borrowers may continue actions through (i) Appeals to allegedly Independent Appeals’ panels, (ii) Financial Services & Pensions Ombudsman and/or (iii) the Courts. In addition to (A) returning the Present Value of their own money back to Borrowers, all offending Banks must (B) recognize valid entitlements to incremental evidenced Consequential Losses (indirect but attributable costs) and financial estimations of negative qualitative consequences. Allegedly independent overseers of the various Tracker Redress schemes are EY., Grant Thornton, KPMG, Mazars, PWC & Deloitte. A number of Irish lenders under investigation by the Central Bank in relation to the State’s €1 billion tracker mortgage scandal will be sanctioned with multi-million euro fines later this year. There is uncertainty on how many of the cases involving the six mortgage lenders, (including AIB and its EBS subsidiary, Bank of Ireland, Permanent TSB, Ulster Bank and KBC Bank Ireland), will be settled in 2019. The Central Bank has accumulate a lot of evidence ( some of which from Whistleblowers). Inter alia this consists of old emails, paper/ computerized files, meeting minutes. There is supposed to be a large team of specialist investigators involved. 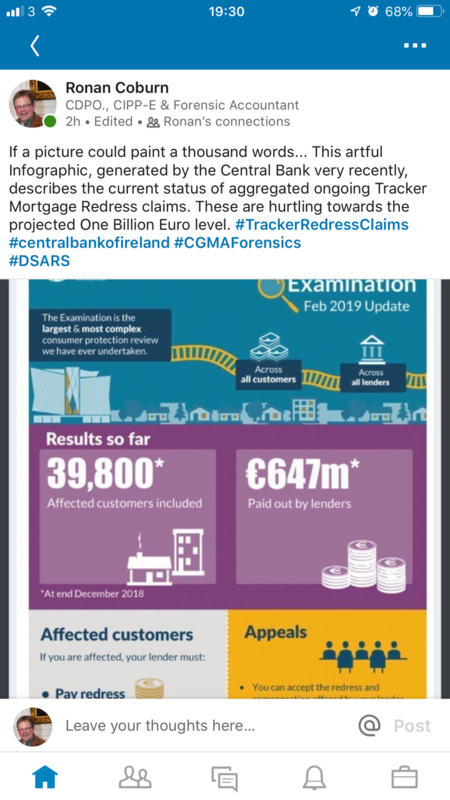 The Investigation is examing the conduct of banks and senior individuals within them, as far back as 2005 when lenders began to wrongfully deny borrowers their rights under Tracker Mortgage agreements on a concerted grand scale. Significantly the investigators are examining how banks handled the matter, since 2015 after the Central Bank ordered them to examine their books for impacted customers. the objective of the Appeals Mechanisms is to make provision for individual circumstances, in giving further clarity on additional detail on how specific decisions were arrived-at, and/or to deliver a clearer case with respect to financial/ non-financial damages suffered by impacted Borrowers.